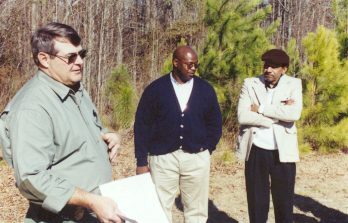 South Carolina Forestry Commission law enforcement officers investigate more than 200 cases of timber theft and fraud every year. The actual extent of timber theft and fraud in South Carolina probably exceeds $10 million annually. Most buyers are honest and will give you a good price for your timber, but you can protect yourself against theft and fraud by taking a few precautions. You are approached by an unsolicited buyer. A buyer tries to pressure you into a quick sale. A buyer says your trees have pine beetles and you need to cut them quickly. After the first buyer, you are approached by others in rapid succession. They may be working together. The buyer generalizes about the area and volume to be cut, will not set a specific date for harvest. The logger on your land is also hauling wood from adjacent timber tracts. Logs and pulpwood are mixed on the truck. Log trucks are hauling at odd times of the day, on Sundays, or at night. Boundary trees have been cut or boundary lines removed. The buyer won't return your calls. The buyer tells you "the check is in the mail" or blames late payment on the mill. Know your timber's current value, prices change from year to year, season to season. Know how much timber you are selling. Get more than one bid. Make sure you have a comprehensive written contract (samples available from the Forestry Commission). It should specify: how the contractor will pay and when; what products are to be harvested; the price for each product; to which sawmills or wood yards different products will be hauled. Establish and permanently mark property lines. Get to know neighbors. Form a cooperative watch. If you don't live on the land, visit or ask someone to check regularly. Spend some time monitoring logging operations on your property. Keep records on your timber sales. The State Forestry Commission can help you. and ask for Law Enforcement.